Last week saw Nishino leave his role as Japan coach, before departing, however, he had some harsh words for his critics. 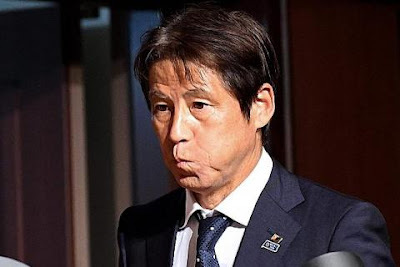 The Japan FA (JFA) confirmed last week that Akira Nishino would not carry his role on now the World Cup is over for Japan. Although the coach and his team were giving a positive welcome home the former coach was still angry about his critics. Nishino was clearly not happy about how he was criticised for his tactics especially in the game against Poland where he ordered his team to run down the clock knowing the 1-0 defeat was enough for them to qualify. As the World Cup coach for Japan said: "I want to thank all the people who said they hated Japan or wouldn't support Japan any more, thank you for your interest in us." There was clearly a large element of irony in this statement of course. The JFA president Kozo Tashima went on to explain at the press conference how pleased he was with the national side. As the JFA president said "I wanted to improve the team's chances by 1%, (after sacking coach Vahid Halilhodzic). I asked Nishino to produce a small miracle so I'm very proud of the team's efforts. But I will not try to persuade him to stay." The next coach of Japan remains unclear but at the moment Juergen Klinsmann and Arsene Wenger are the front-runners.